the flag raising atop Mt. Suribachi. among his fellow 31st SEABEEs' station on Iwo Jima. to memorialize a powerful chapter in American History. Sadly, Mr. Waldon T. Rich, passed away this past August. He will be sorely missed by his family, friends and fellow SEABEEs'. Image of the Waldon T. Rich. Mr. Waldon T. Rich in an image taken circa 1980. He was an avid lover of the outdoors. The image was taken at a camp ground in Mommouth Mountain where he has a summer camp grounds host. Waldon T. Rich's personal photos taken during his tour on Iwo Jima. Images of the 5th Marine Division cemetary where he helped to make the plaque on the stonebase. Circa 1945. TIME Magazine story about the Iwo Jima flag raising atop Mt. Suribachi taken by Joe Rosenthal. 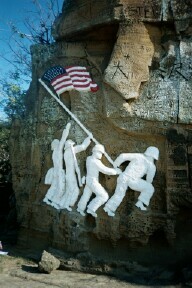 This is the image that inspired the rock carving that Mr. Rich did in honor of the fighting men on Iwo Jima. Persistence gains recognition for WWII sculptor on Iwo Jima. This image shows Dale Rich's twin sister, Arlene, (deceased) in front row from left, with her co-workers who were working to get recognition for Waldon Rich's carving. Waldon T. Rich's rock carving as it appeared in a newspaper article. Image is from family photo album and as of yet is unidentified..
A yet to be identified set of images taking at the Waldon T. Rich's rock carving on Iwo Jima. The images above are from the Rich's personal family album. Thanks from the Coast Guard. Newspaper clipping with article about the correspondences between Dale Rich and the Coast Guard Lieutenant on Iwo Jima when he came home on a training mission. Dale's twin sister, Donna, is on the left, Waldon T. Rich second from left, the the Coast Guard Lt along with some of Donna's co-workers. Waldon Rich is holding a color aerial photograph of Iwo Jima given him by the Coast Guard Lt.
Rock Carving by Waldon T. Rich. Image taken during the 2002 tour of Iwo Jima by Ms. Diane Kuebler, whose father had also served on Iwo Jima with the Navy Seabees'. the 2002 tour of Iwo Jima by Ms. Diane Kuebler. Dedicated to the brave men who lost their liveson this island February 19, 1945. Carved and dedicated by Mr. Waldon T. Rich. The information above was compiled from e-mail messages received in March 2003 from Mr. Waldon T. Rich's son and daughter, Patricia and Dale Rich. Some of the above images were also contributed by Ms. Diane Kuebler, the daughter of the late Arthur O. Kuebler who is a member of the 31st Navy SEABEEs' Association and who recently toured Iwo Jima in March of last year. Includes a section on the recent visit to Iwo Jima in March of last year. 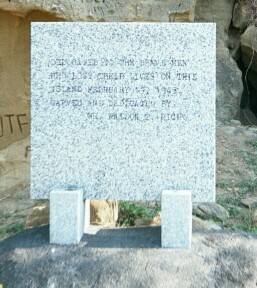 This image and the one below are from a Japanese web site and include a dedication marker crediting the rock carving to Mr. Waldon T. Rich. Close up view of the dedication marker to Mr. Waldon T. Rich. 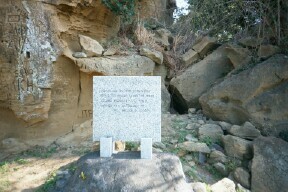 Includes a few additional images of the rock carving taken over the past years by men stationed on Iwo Jima.